Our ears pop as we climb up the mountain in the car on our way to another site visit — this one near Roumieh, Lebanon. Out the window are herders and their sheep, olive and pine trees, and a view worth writing home about. From this height, we see that there are even higher mountains due East, and the next range over is topped with snow. A light sea breeze on this sunny day guides us along. On a day like this, you could enjoy swimming in the Mediterranean and then drive an hour to ski — a testament to the geography’s diversity. Everything here is diverse: the land, the food, the people, the church. While much of CNEWA’s work in Lebanon and beyond is centered around some very basic humanitarian needs — schools, hospitals and refugee camps, for example — our specific mandate from the Holy Father to accompany the Eastern churches means that all our humanitarian work carries with it a crucial spiritual component. That is, the work that we do is an extension of the hands of Christ, and while we offer support to all — regardless of creed or background — our love for all comes from our pastoral roots. That has been especially evident in today’s pastoral visit as we continue to accompany Msgr. Kozar in meeting the papal nuncio, Archbishop Gabriele Caccia; Maronite Patriarch Bechara Peter of Antioch, the head of the largest church in Lebanon; and finally Melkite Greek Catholic Patriarch Gregory III. Not only was it an honor to meet them, but it was also touching to hear of their genuine, profound concern for Christians and all people throughout the Middle East. Their pastoral perspective was enlightening, as were the views of the Basilian Chouerite Sisters, a Melkite order, who kindly fed us a traditional Lebanese lunch. These sisters run Father Robert’s Institute, which serves over 100 students with hearing impairment, autism, cerebral palsy or other special needs, offering each an education and vocational training in a way that equips these students to confront a world that may not understand the challenges they face. Father Robert’s has seen students go on to university and gainful employment. One recent graduate is, in fact, currently tutoring students at his university. We observed several classes: an auditory training where students were practicing on percussion instruments, a physical therapy class where students no older than 7 made their way through an obstacle course, and one-on-one special education for a young girl with autism. In each class, the enthusiasm and care of the instructors was palpable and contagious. Our final visit of the day was to St. Ann’s Greek Catholic Seminary where 17 young men from Jordan, Lebanon, Palestine and Syria are preparing to serve the church as priests. It’s one of hundreds of seminaries CNEWA supports throughout the areas we serve. We asked how their vocation applied especially to caring for people who are suffering, and their answers were deeply moving. They explained that, on a practical level, the focus of their dioceses was to continue to provide educational programs — but above and beyond that, the seminarians all desired to ensure that the faith of their ancestors was passed down to youth in their community, even amidst ongoing turmoil. One seminarian spoke of returning to his hometown of 500 people — a town that once held 65,000. Another seminarian, a deacon, acknowledged the real and present danger that his community might resort to violence as an answer to violence. For him, his hope was to offer a third way: that, through education and example, they can instead build a culture of forgiveness, understanding and, someday, peace. At the end of our meeting, they sang an ancient Melkite chant in Arabic, “God Is With Us.” We could hear the faith and resilience as their voices filled the hall, and it moved us to tears. Back down the mountain, we prepare for our final day in Lebanon — a trip to the Bekaa Valley. We’ll be carrying some of the courage and hope the resilient people we’ve met have shared with us. Something about being in a place so different from the one you call home can, at first, overwhelm your senses. It’s the smells of the manakeesh, a Lebanese pizza of sorts. It’s the church bells mingled with the call to prayer. It’s the green mountains against the calm sea — a much different sight than the stone-cold steel and concrete of New York City. And of course, it’s the laughter and joy of refugee children — smiles born out of hope they found as they were accompanied by the love and support of CNEWA. All of it can be a lot to take in, so on our third day of reviewing CNEWA-sponsored programs, we sat over a simple but delicious meal of Lebanese mezze (various small snack dishes) in Beirut to jot out a few thoughts and process a little more of our trip together. We’ve visited four institutions thus far: Monday brought us to the St. Antoine Dispensary run by the Good Shepherd Sisters, and the Angels of Peace School run by the Syrian Catholic Patriarchate. Tuesday’s visits included the Fratelli School for Syrian refugees run by the Marist and Lasallian Brothers, as well as a visit to the Joint Christian Committee School for Syrian refugees of Palestinian origin. We both agreed, immediately, that the programs exude overwhelmingly beautiful warmth of spirit. Despite each person we met having endured unimaginable suffering in his or her own way, their joy was contagious. At the St. Antoine Dispensary, judiciously overseen by Sister Antoinette Assaf, Iraqi refugees who have settled in the neighborhood, along with poor Lebanese, receive much more than medical care. There is a strong focus on education and awareness, especially because many of the refugees were unaware of the hygienic challenges of living in a dense urban setting. New waves of refugees, from different parts of the country, have brought new challenges, and Sister Antoinette, with help from CNEWA, has responded quickly. Currently, the clinic offers services in ophthalmology, dermatology, dental services and gynecology, which, thanks to our support, are available for just $12 for each patient — a cost the clinic sometimes covers when the poorest of the poor cannot. The Angels of Peace School, which Chris wrote about yesterday, hosts almost 500 Iraqi Christian refugees. With the support of our Beirut office, the Rev. Youssef Yaacoub has rented out a private school that his students and teachers can use each afternoon. Every student had a smile for us. And, of course, visiting the Fratelli School, near Saida, was a real treat. Run jointly by the Marist and Lasallian Brothers at the request of Pope Francis for congregations to join together to tackle the challenges facing refugees, this institution hosts 270 Syrian students, both Muslim and Christian. We met the dynamic Brother Andres Gutierrez, who oversees the school along with Brother Miquel Cubeles, a Marist from Barcelona. When we arrived, the students were at lunch and recess, and eagerly approached us on the colorful playground. Many even offered us their food, an act of charity that moved us deeply. Brother Andre explained that he had rebuilt the school when he arrived, as the structure had sat abandoned for over 25 years prior to his arrival. The school has been open for just a year, and in that time they’ve completed several classrooms, a kitchen, a residence for the brothers and a computer lab. As it focuses on acclimating refugee students to the Lebanese curriculum, which is taught in French and English as opposed to the Arabic Syrian students are used to, the school will function as a remedial program of sorts, easing students into the Lebanese school system to improve their likelihood of success. We also visited a nearby high school in Saida for 213 Syrian students of mostly Palestinian origin. 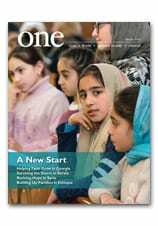 It focuses on training students who aim to take the Syrian national examinations, which are recognized worldwide and required for students before they can go to college. We dropped by a few classes, where young men and women were busy studying and taking practice tests. Someday, we pray, they will return to Syria to help rebuild their country. On the way back to Beirut after a full day, we stopped at the impressive Shrine of Our Lady of Mantara in the Melkite village of Maghdouche. According to tradition, Mary waited in a cave here while Jesus was preaching in Tyre and Sidon, known today as Saida. The spot is marked by an ornate Melkite Greek Catholic church and a tower offering beautiful views of Saida and the Mediterranean. We were struck by how many refugees have been “waiting,” perhaps wondering where their lives might lead. So many are in limbo, but with CNEWA’s support, there is a path forward. As Msgr. Kozar told students we visited, “There is a bright future” awaiting these students who prepare now for the hard road ahead. It won’t be easy, but hope is always a light in the dark. As we cross the halfway point in our journey, we’re constantly reminded of the light CNEWA brings to many. Hope is in the face of everyone we’ve met. The mission is alive — we’ve seen it!